This Meme was created and started by David Horvtiz in April 2009 who is a New York artist.He started to post it on Tumblr and gave instructions to audience about it . Putting your head in freezer and tagging it on Tumblr with caption 241543903 was one of the instruction.He said to his/her friends to repeat this action and upload this photo on internet after taking photo. 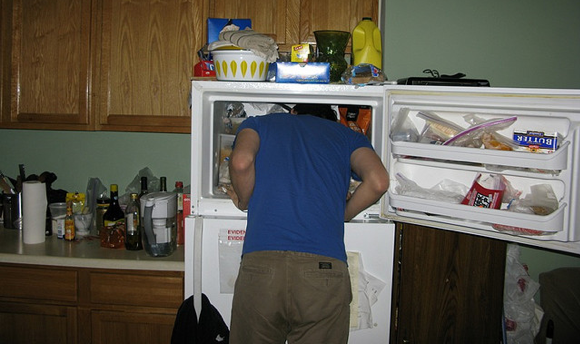 David Horvitz picked a combination of the serial number of his refrigerator and the barcodes on a bag of edamame and a package of frozen soba noodles . First photo was uploaded by David on his Tumble Account Horvitz' Flickr account on April 6, 2009. Then David send 100 fliers of this meme to his friends in brazil and also very soon this photo blow up on Orkut.This was spread to Flick in 2009 and was very popular in japan and hence then in 201o it was also very popular on facebook. Just put your head in refrigerator and take a photo of your self from back or from side because you cant take photo from front because your head will be inside freezer.then Rename this photo with this number and upload it on Google,Faceebook,Pinterest,Orkut,Flickr,Blogs or websites and when you will search on google this number, your photo will also be shown there. Copyright @ 2013 241543903 / Heads In Freezers Meme.